Jim saw the list and said he d be eating grapefruit for dinner, since he wasn t interested in consuming something with avocados and bananas in it. 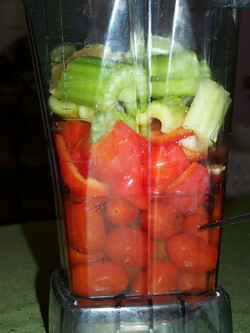 Since the challenge doesn't require you to use all of the ingredients, I promised to make something he could eat, too. That means the dish needed to be easy to consume, since his mouth is still healing from the wisdom tooth surgery. After looking at the list of the ingredients we had in the house, and knowing that it had to be something Jim could eat, I saw a veggie soup wanting to be born. 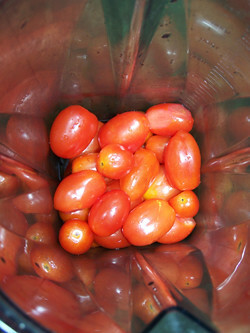 Wash and coarsely chop all produce and place into VitaMix blender. 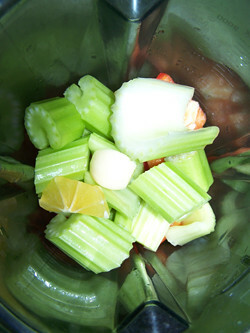 Blend and serve garnished with some celery and a squeeze of fresh lemon juice. 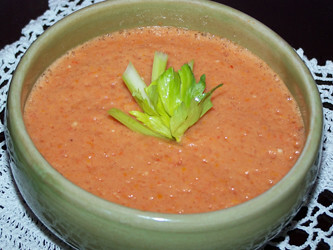 I know the spicy red pepper wasn't on the list of ingredients, but the soup really needed some heat added to it---and since I refuse to cook it on the stove, the only other way to add some heat was through the use of a spicy pepper. ;-) If you are interested in the challenge, check it out and let us know what you create! *Over the past two years I have realized that if a dish is going to be blended and lemon juice is called for, it s better to simply remove the lemon skin and use the entire lemon instead of just its juice. 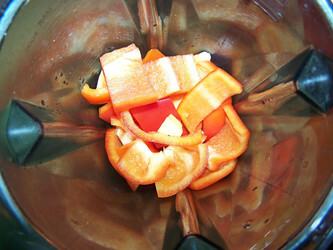 You get more of the lemon juice this way, as well as more of the nutrients that would normally be wasted.